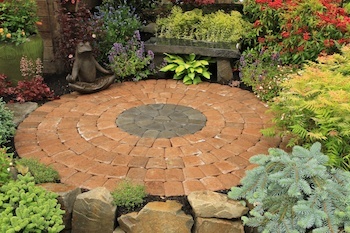 Planscapes is awarded “Best Display Garden of Show” at Sorticulture 2012, Everett’s Garden Arts Festival. This is our second year of being awarded Best Display Garden of Show. The garden’s theme of a peaceful retreat gave show visitors a chance to pause, relax and breathe in the natural beauty. Many visitors commented on how much they would appreciate a similar garden sanctuary in their own yard. We combined colors and textures of foliage and flowers to showcase the artistry of nature. The display was also awarded “Most Artistic” display.